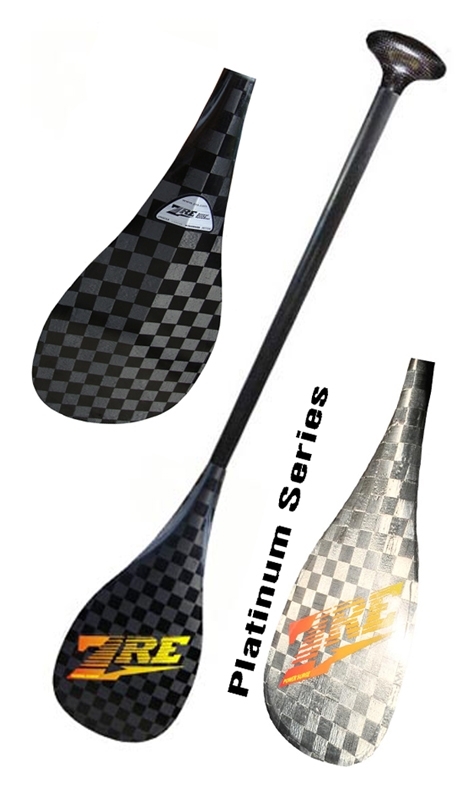 Buy ZRE (Zaveral Racing Equipment) paddles now at Paddle Dynamics. Free freight!! Paddle Lengths: 46" 47" 48" 49" 50" 51" 52" 53" 54"
The ZRE Power Surge Light flatwater paddle is the most popular marathon canoe racing paddle in the US. It is also a great paddle for any distance race or just paddling around the Boundary Waters. Super light, stiff and durable. This 8.5 oz. Power Surge Flatwater Canoe Paddle is designed by Bob Zaveral, Serge Corbin and Olympic Gold Medalist Greg Barton. It sports a Carbon Fiber Power Surge Blade at a Length of 18 inches with Carbon Fiber Edges & Tip, a Pre-Impregnated Carbon Fiber Shaft with a Standard angle 12 of degrees, and has Carbon Fiber Grips. Manufactured in the USA! Only stocked in the 8" (100 Sq") width which is by far the most common sized blade.